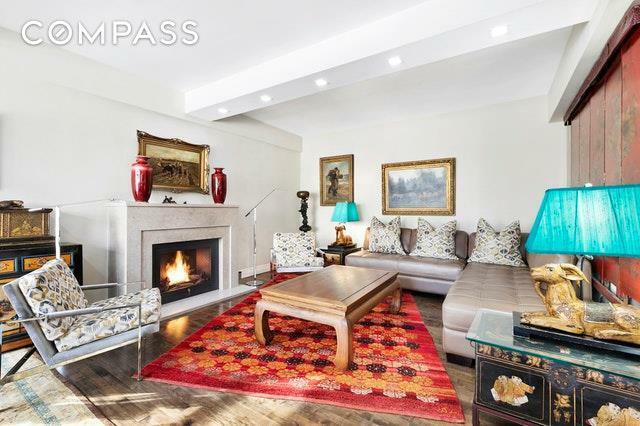 FIRST OPEN HOUSE BY APPOINTMENT ONLY: 2/17 12-2!A tranquil retreat in the heart of Midtown West, this gorgeous and sunny 2 bedroom, 2 bath duplex offers that most elusive of all NYC amenities.outdoor space! 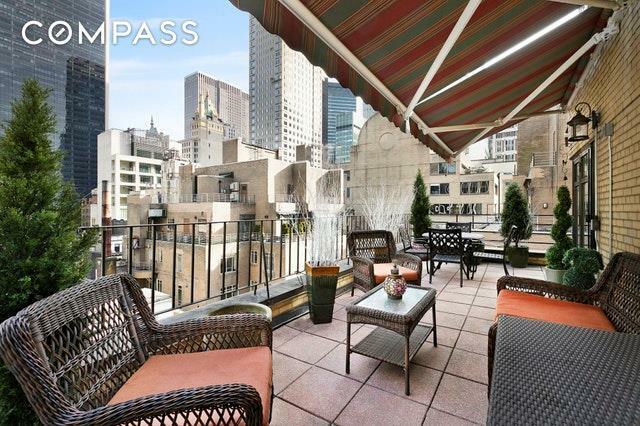 Choose to have your morning coffee or entertain friends and dine al fresco in the evening on one of the TWO terraces, totaling over 400 square feet! This very special home in a full-service coop, was thoroughly renovated to preserve its beautiful prewar deco features, including beamed ceilings. 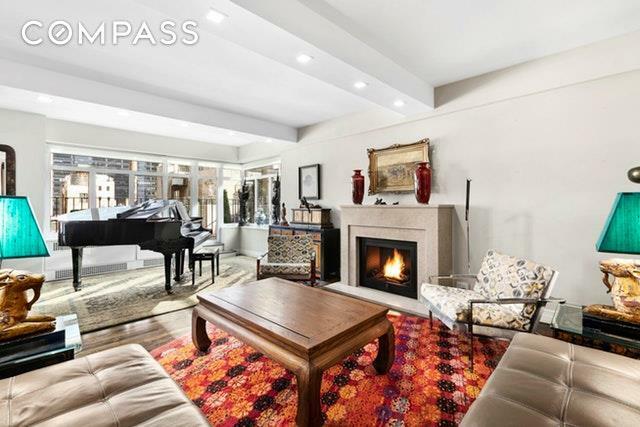 The apartment's first level features the living room with a Hearth Cabinet fireplace and marble mantle, two distinct seating areas, custom floor moldings and lighting and two closets. The entire floor is bathed in natural sunlight from a wall of windows and glass door leading to the terrace on this level. The windowed open kitchen, with easy access to the dining area, has all Jennair appliances and Cherrywood cabinets with crushed quartz counter, backsplash and island. The powder room has floor to ceiling Italian marble with inlaid silver trellis design and marble floor. An original curved deco wrought iron banister leads to the two bedrooms and two full baths and a huge terrace that wraps the entire upstairs area. The master bedroom, which easily accommodates a king-sized bed, is ensuite and has good closet space with storage to the ceiling. Bright and light, the second bedroom leads to the very large terrace which easily accommodates a dining table and chairs plus a separate seating area. Both full baths are windowed with glass showers, with radiant heat in the second. Additional features of this stunning home are brand new central air conditioning, Skyline double pane windows, beautiful flooring (maple downstairs; teak upstairs) and lighting, water and electric on both terraces. Pets allowed! 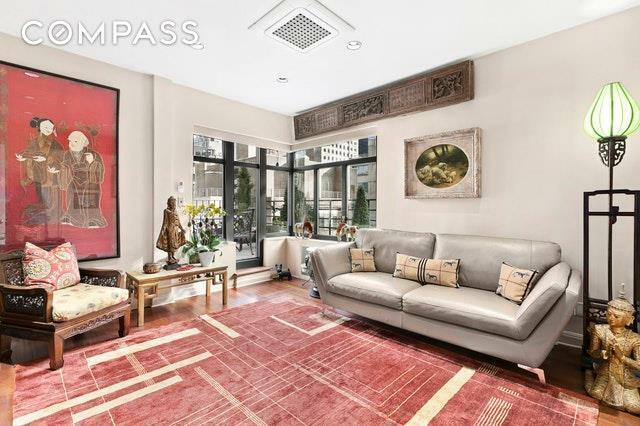 All of this in the thriving Midtown West neighborhood with so much outside your door - Fifth Avenue shopping, fine restaurants, MOMA, Carnegie Hall, theater and Central Park!